Local 34 Training Director Brandon Currie, whose apprentices configured and installed the lights on Peoria’s New Year’s Eve ball, talks about the project with Clare Zell of the Peoria Civic Center on Facebook Live. On the coldest New Year’s Eve in the history of Peoria, Ill., members of IBEW Local 34 gave residents a dazzling reason to brave the weather. The city’s annual winter festival became a smaller, but no less enthusiastic, version of New York’s Times Square as a giant ball bursting with more than 2,000 points of light descended 130 feet from a crane, first at 7 p.m. so that youngsters could enjoy it and again at midnight for celebrating adults. 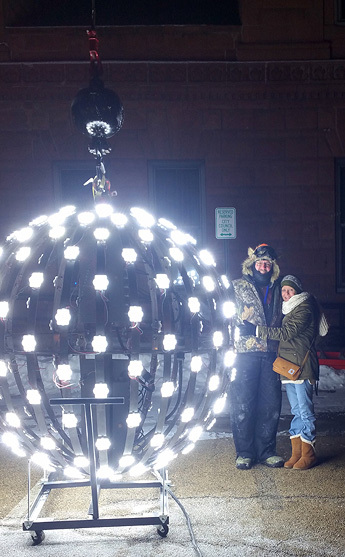 Attached to a crane, the luminous 6-foot-wide, 1,550-pound stainless steel ball descends 130 feet to the ground at Peoria’s Winterfest on New Year’s Eve. Local 34 is part of a Peoria labor-management coalition known as Better Built – the Union Construction Network. The IBEW, Sheet Metal Workers and Operating Engineers – who ran the crane – were involved directly while other trade unions contributed money and supplies. Employers did as well, Flynn said, citing Kaiser Electric for help with the LED lighting plan and Oberlander Electric for donating materials, rigging equipment and manpower. It was so cooperative, in fact, that Peoria Civic Center staff told Flynn they’d never had a partnership work out so well. “They said they usually end up doing all the work, but ‘you guys just took off with it and made sure it was on time and safe,’” he said. Local 34 Business Manager Paul Flynn, pictured with his wife after the ball touched down outside Peoria’s city hall. The Sheet Metal Workers designed and welded the ball, taking inspiration from New York and several small Midwestern cities that have fashioned their own ball drops. Then, with barely a month to go, it was the IBEW’s turn. The lighting design was a challenge, as was the cost. Flynn said the fixture they originally wanted was priced at an impossible $34,000. But Kaiser tracked one down for $3,000 and the civic center paid the tab. IBEW apprentices, under the tutelage of Local 34 instructors and Training Director Brandon Currie, figured out how to install, wire and power the fixture, which had 220 LEDs, each with 10 points of light. “It’s the best hands-on training an apprentice can get,” Flynn said. The ball is being stored at the local’s training center and will continue to be a teaching tool. Being rust-proof, it can be reused indefinitely, allowing future apprentices to design, install and program new lighting. A trial run the week before Christmas confirmed the crane could lift the ball and lower it in a 59-second countdown. 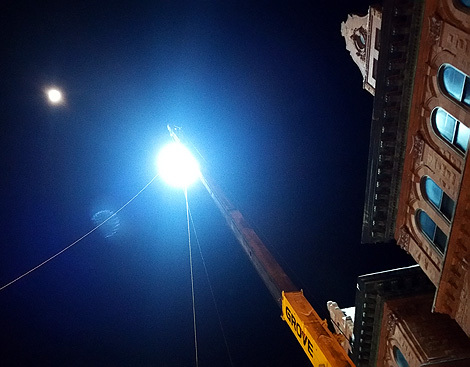 Although the crane rental site didn’t have a strong enough power source to illuminate the ball, Flynn said the lights had been tested throughout the building process and worked perfectly. But to see their creation light up the night sky, IBEW members had to wait with other hardy souls on a New Year’s Eve when the wind chill hit minus 30. Asked by the Peoria Journal Star if it was worth the frigid wait, one beaming family said, “Yes,” without hesitation. A civic center spokeswoman told the newspaper that while the bitter cold kept some people away, the unions gave the city a gift that area residents will enjoy for many years to come.